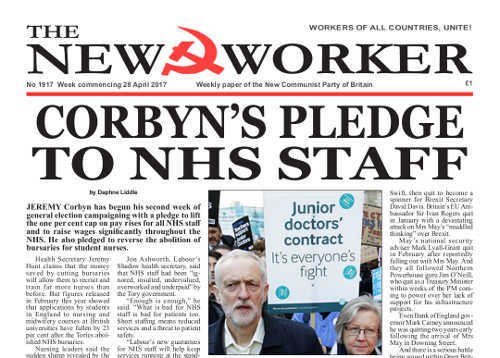 JEREMY Corbyn has begun his second week of general election campaigning with a pledge to lift the one per cent cap on pay rises for all NHS staff and to raise wages significantly throughout the NHS. He also pledged to reverse the abolition of bursaries for student nurses. ANTI-FASCIST campaigners gathered outside the French embassy in Knightsbridge in London on Monday evening to protest at the growing menace of fascism in France represented by the Front National candidate in the French presidential election, Marine Le Pen — and to express solidarity with French anti-fascists. Read the full story here >> Jamais Le Pen, Never Again! GIVEN THE unseasonal snowy weather it was appropriate for the Scottish Trades Union Congress (STUC) to choose the upmarket ski resort of Aviemore as the venue for their 120th annual conference. No doubt the promise of a bar stocked with 60 varieties of local malt whiskies did not influence the organisers’ choice of venue.